← How to convert prn to postscript? If you want your readers to know your PDF file is created by which software application, you will need to edit PDF creator when convert HTML to PDF. In fact, VeryPDF HTML Converter provides two ways to solve your problem. You can either allowed to edit PDF creator and convert HTML to PDF via the command line version, or via the GUI version. Some of you may think the GUI version is easier to use because of the mouse. However, if you want to save your time, you are recommended to use the command line version of VeryPDF HTML Converter. Because using a mouse and keyboard to control your operating system is much slower than working in a command line. 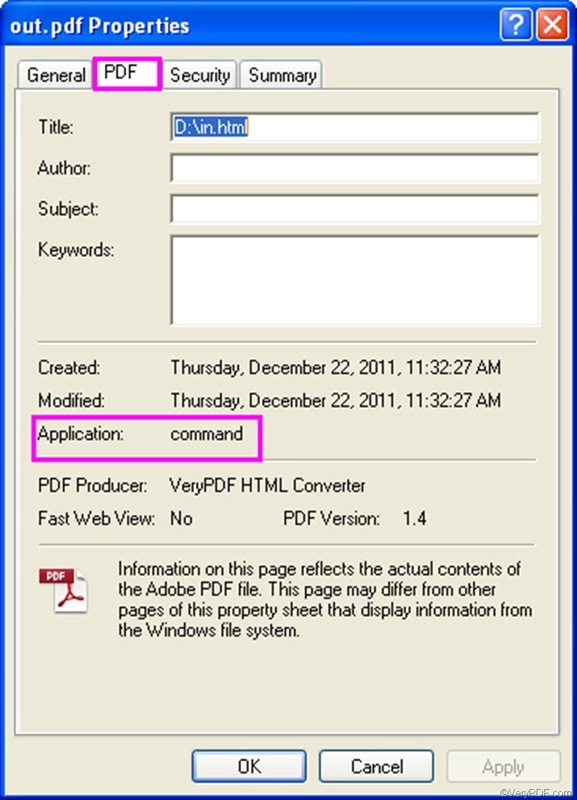 This article will focus on the command line application of VeryPDF HTML Converter. This command line application does not require any Adobe product installed in your computer, yet is able to create PDF from HTML. The rest part will take three steps to introduce the way to convert HTML to PDF and edit PDF creator via command line. You can free download the command line application of VeryPDF HTML Converter by clicking VeryPDF HTML Converter Command Line. It will take only a couple of seconds to install this application. You are allowed to use it free for 50 times. Click “Start” in the lower-left corner of the screen. Select “Run” from the menu to open the “Run” dialog box. When you see the command prompt window on the computer screen, please type a command line in it. The command line syntax below may be helpful if you don’t know what should be included in a command line. The angle brackets are used to enclose essential contents. string refers to character string. D:\htmltools\htmltools.exe ----The directory of the command line application. It represents the command application stored in the folder called htmltools on disk D. htmltools.exe is the name of the command line application. It is always stored in the folder named htmltools. However, the place where the folder htmltools is placed varies, according to different computers. -creator "command" ---- defines PDF creator as "command”. D:\in.html ---- the directory of the input files. It represents the input file named in in the format HTML on disk D.
C:\out.pdf ---- The directory of the output file. It specifies PDF as the output format, and indicates that the output file should be named out and be placed on disk D.
Press “Enter” after you type the command line in the command prompt window. The computer will begin to covert HTML to PDF and edit PDF creator right away. You can also view the information of conversion in the command prompt window as illustrated below. When you see “Result=OK”, that means the job is done. To check the result, you should right click the icon of the output PDF file, select “Properties” on the menu to open the “Properties” dialog box, > click the “PDF” tab, then you can find “command” after “Application” in the dialog box. You can try the command line application of VeryPDF HTML converter for 50 times. If you want to buy it, please click Purchase. This entry was posted in VeryPDF Blog and tagged command line, HTML to PDF. Bookmark the permalink.